NEW YORK, NY -- (MARKET WIRE) -- December 6, 2006 -- US Internet advertising spending is expected to reach $16.4 billion in 2006, a 30.8% gain over last year's $12.5 billion figure, according to new estimates from eMarketer. This estimate revises eMarketer's more conservative prediction in September, when many analysts expected Yahoo's third-quarter revenue wobble to have a larger effect on the overall market than it has. 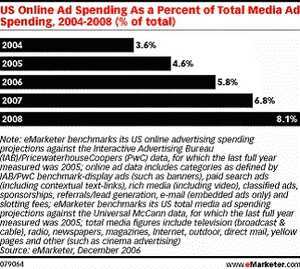 The new estimate emphasizes how online ad spending is taking a larger chunk out of the overall media spend each year. In 2006, US marketers are expected to devote 5.8% of their budgets to the Internet, and by 2008, this share will rise to 8.1% of the total. As online ads attract more media dollars, total US ad spending is expected to remain relatively flat. 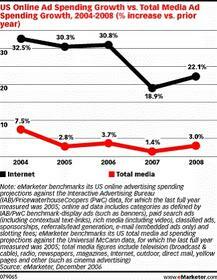 In 2008, eMarketer estimates Internet advertising to grow by 21.8%, while total spending languishes at 3.0%. This disparity will signal a watershed for media, as Internet ad spending catches up to radio. "At the rate Internet ad spending is growing, it should match radio next year and will surpass it in 2008," says David Hallerman, eMarketer senior analyst. For the first three quarters of 2006, for example, TNS Media Intelligence said radio accounted for 7.5% of total ad media. And as of June, Universal McCann data showed radio would comprise 6.9% of the total ad spend. "It's one thing for Internet ad spending to surpass relatively minor media such as outdoor or yellow pages, but it's quite another thing to blow past radio, one of the big four traditional media," Mr. Hallerman adds. "Those marketers who put only a tiny share of their ad budgets online are losing a chance to reach the audience." eMarketer is "The First Place to Look" for market research information related to the Internet, e-business, online marketing and emerging technologies. eMarketer aggregates and analyzes e-business research from over 2,000 sources, and brings it together in analyst reports, daily research articles and the "eStat Database" -- the most comprehensive database of e-business and online marketing statistics in the world.